Are you too Twitter-obsessed in your social media approach? Twitter’s role as a conduit for the Zeitgeist is unrivaled, and it has almost single-handedly ushered in the era of real-time search, and social CRM. But, it’s the online equivalent of HBO – important more because of who uses it and the media’s infatuation with it, rather than the actual size and impact of its audience. But, Twitter alone does not constitute social media, and you’d think it does given all the disproportionate attention being paid to it at conferences and trade publications. I presented a half-day workshop at the Email Evolution Conference on social media strategy (slides here) recently with DJ Waldow and Mike Corak, and the significant majority of the questions from the audience were about Twitter. That got me thinking that perhaps social media types aren’t fully recognizing Twitter’s limitations? The true size of the Twitter audience is a bit tricky to pin down because 55% of its users do so via third party and mobile applications. But, new data from Compete.com shows a clear stagnation in Twitter’s runaway growth. 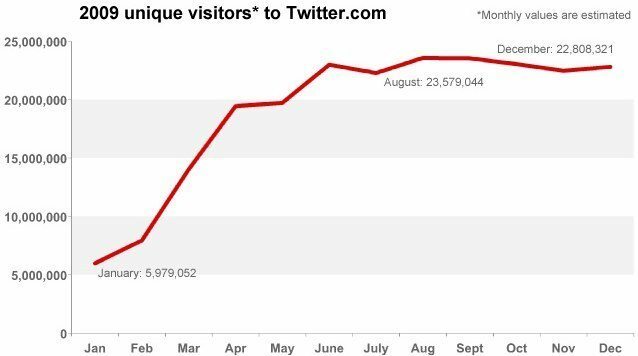 According to these numbers, the audience using Twitter actually declined from August to December, 2009 (during the same period, Facebook went from 250 million to 350 million members). Today’s marketing coordinator is tomorrow’s CMO, and younger Americans don’t embrace Twitter. A new Pew Research study shows only 8% of U.S. teens using Twitter, compared to 66% engaged in texting. Do young people not appreciate the many to many nature of Twitter, preferring the 1:1 paradigm of text messaging? Regardless of the reason, as the current teen population ages, it threatens Twitter’s preeminence unless adoption rates soar. Twitter lists, while useful for categorizing people to follow, haven’t really taken off either. Nor has the new, integrated retweet capability. With each new release of features being met with tepid response, Twitter users are making the statement that they like Twitter just the way it is. That’s great for keeping the existing user base satisfied, but further impedes growth potential. You may remember that Twitter refused Facebook’s $500 million buyout offer last September. So as expected, Facebook just added Twitter-style features and functions to its service, to evaporate Twitter’s competitive angle. Updating Facebook from third parties like Tweetdeck? Check. Tagging people with @ within status updates? Check. Posting to Twitter directly from Facebook? Check. Stripped down interface option, with status updates at the core? Check (Facebook Lite). Retweet-style sharing tools? Check. Functionally, everything Twitter does, Facebook does just as well, with the exception of mobile usage. Because Facebook has so much more overall functionality than Twitter, the mobile experience is a bit more clunky than Twitter. However, it’s important to recognize that 3 times more people use Facebook from a smart phone every month than use Twitter at all. Being a new user on Twitter is as lonely as Michael Boublé at a Green Day concert. What’s Happening? it asks, followed by a box and a blinking cursor. Twitter success requires an understanding of the unique rhythms and cadences of the community, and a give first, get later mentality that is a bit counterintuitive at first. The site is exceptionally poor at welcoming and training new users, which may result in its high churn rate. But a bigger problem with Twitter is that like CB Radio, it doesn’t scale well. If you have a few hundred followers, you can semi-coherently keep them straight, and watch what they are doing via your public stream. But, once you get into the many thousands of followers, that public stream is a cacophony at best. Twitter lists can help in this regard, but many Twitter power users lament that the way they use the service is forced to change significantly as their own Twitter connectivity increases. Much less time is spent in the public stream, where discoveries occur, and much more time is spent answering replies, and monitoring relevant topics via Twitter search. When you’re most popular users are the ones that have the hardest time using your service to its full advantage, you have some issues to consider. However, Twitter’s announcement this week at SXSW that they are adding @anywhere – essentially Twitter’s answer to Facebook Connect – should make the follow/following process easier and more contextual. The new location-based darlings FourSquare and Gowalla are stealing a lot of the place-based intimacy that originally propelled Twitter. The “original” Twitter contained a substantially larger percentage of tweets about the author and what he or she was doing in their own life at that moment. That type of status update has been migrating, first to Facebook , and now to the location services. Because you actually know the people you are connected with in most cases, FourSquare and Gowalla feel a lot more like the original Twitter, with a sense of engagement that today’s Twitter can’t deliver. Other than retweets and clicks – data that inexplicably is only available from third parties – Twitter provides no statistics to its users other than followers/following. Meanwhile, Facebook has been busy adding layers to its Insights platform, which provides a nuanced dataset enabling business users to test, optimize, and evaluate the efficacy of their time spent on Facebook. The lack of integrated metrics on Twitter may not be a big deal for personal users, but for corporations looking to embed Twitter into an integrated social CRM approach, it’s a gaping hole that is currently being patched by inefficient, home grown workarounds. I love Twitter. It enriches my life every day. I hope it sticks around for a long, long time. But, figuring out what you want to do on Twitter is not your “social media strategy” – it’s just a short-term, tactical plan for a platform that survives despite its shortcomings. (Post originally written for Social Media Examiner – modified today for this version).